The Monk Tikhon of Lukhovsk, and Kostroma (in the world Timofei), was born within the bounds of the Lithuanian princedom and was in military service there. In the year 1482, not wanting to accept Uniatism, he went from Lithuania to Russia. 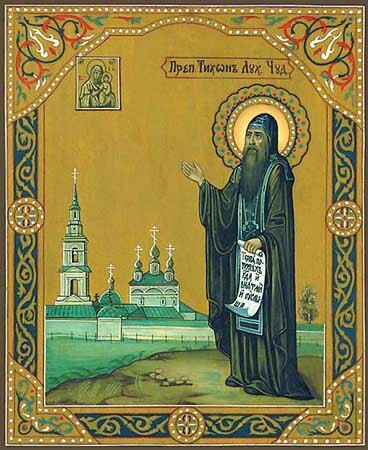 The saint gave away everything that he had, accepted monastic orders with the name Tikhon and settled in Kostroma diocese in the Lukhovsk region. The city of Lukh was at that time given to prince Feodor Bel'sky, together with whom the Monk Tikhon had come from Lithuania. On the banks of the boundary of the Kopitovka the Monk Tikhon made his cell. When two monks, Photii and Gerasim, came to him in the wilderness, the monk because of them moved a distance of three versts from the Koptovka to a more satisfactory location. The monks earned their living by the work of their hands. The Monk Tikhon copied books with skill, and was a fine lathe turner. Out of humility he did not become a priest. The Monk Tikhon died on 16 June 1503, in such poverty, that his disciples did not know how they would bury him. But to their comfort the archbishop of Suzdal' sent a monastic burial shroud, in which to consign him to the earth. Soon after his death at the place of his labours there arose a monastery in honour of Sainted Nicholas the Wonderworker. In 1569 at the grave of the Monk Tikhon there began healings of the sick, and his relics were found to be undecayed. But the hegumen Konstantin, who brought the relics above ground, was struck blind; having recovered his eyesight, he concealed the relics of the Monk Tikhon back into the ground. From this time began the veneration of the Monk Tikhon. His life with 70 posthumous miracles that were recorded was compiled in the year 1649.